If you don’t like Facebook’s new “Bubble Chat” chat interface, I’ve added an option to allow you to revert back to the old style chat system. You can access it via the FB Purity options screen (see screenshots below). 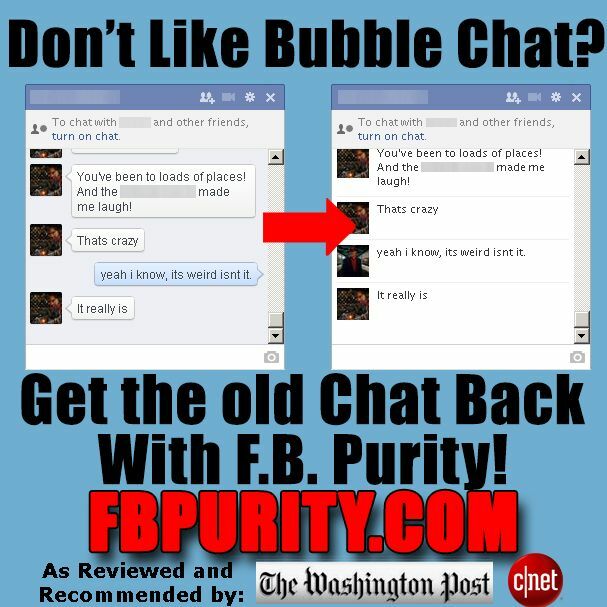 FB Purity v9.1.0 adds an option for reverting Bubble Chat back to the old style Facebook Chat. Lots of people are asking ‘How do i remove Bubble Chat’ / ‘How to get rid of Bubble Chat’. FB Purity is the answer! I’ve also added an option that lets you “replay” a deleted friend alert, if you accidentally dismiss it without reading it. Just press the “F” key shortly after you see the alert, and it will re-display it, so you can read it again. Let your friends know about FB Purity too, spread the word, tell others out who you think would appreciate the benefits of this extension. This entry was posted in Facebook, FB Purity and tagged ad blocking, block facebook ads, Bubble Chat, clean up facebook, Convert Bubble Chat, delete bubble chat, disable bubble chat, Facebook, facebook adblock, facebook adblocker, facebook purity, FB, FB Purity, get rid of bubble chat, get the old chat back, kill bubble chat, Old Style Chat, pop facebook bubble chat, remove bubble chat, remove buble chat, remove facebook ads, remove suggested pages, remove suggested posts, restyle chat, restyle fb chat, Revert Bubble Chat. Bookmark the permalink.